In what I think they're making more out of it than it is, the LA Times has an article saying four states are contemplating legalizing and regulating marijuana. Rep. Mary Lou Dickerson, a Seattle Democrat who is sponsoring the legalization bill in Washington state, said that she "wanted to start a strong conversation about the pros and cons of legalizing marijuana." Under her bill, marijuana would be sold in Washington state's 160 state-run liquor stores, and customers, 21 and older, would pay a tax of 15 percent per gram. The measure would dedicate most of the money raised for substance abuse prevention and treatment, which is facing potential cuts in the state budget. Dickerson said the measure could eventually bring in as much to state coffers as alcohol does, more than $300 million a year. "Our state is facing a huge financial deficit and deficits are projected for a few more years," Dickerson said, referring to the projected $2.6 billion hole lawmakers will need to fill next year. "We need to look at revenue and see what might be possible." 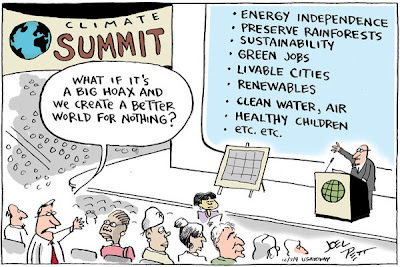 While I'm all for it, we have to be realistic here. Two words. The Feds. The Commerce Clause rules so the Congress makes the rules. A man uses his bicycle to stop two purse thieves making a getaway on a scooter. The first half hour or so was pretty basic stuff and a bit boring for me, but I suppose the program was geared to a lowest common denominator. 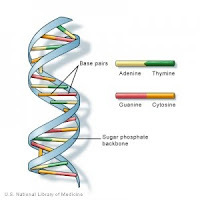 The hour after that was the most interesting and I learned a little more about control genes and their role in how life forms develop. Pretty cool stuff. The next forty years or so of genetic science should be very exciting. There's a lawsuit involving the patent for swingless golf clubs. In a legal battle over gunpowder-loaded golf clubs that can launch a ball more than 200 yards, a federal judge in San Francisco allowed half of the eight counterclaims accusing a Wyoming company and two directors of duping former owners out of the patent rights and trade secrets to the "swingless" golf clubs. The patented clubs enable a golfer to "drive golf balls great distances without swinging through the use (of) a beveled piston and explosives," according to the ruling by U.S. District Judge William Alsup. Yeah, gunpowder-loaded golf clubs. My first thought when I read about this was, "How many course owners, nearby residences and golfers are going to tolerate explosives going off on the course?" Then I checked out the BIG HONKIN' VIDEO on the Swingless Golf web site. It seems quiet enough and they have a note at the end of the video giving the decibel range of regular and the swingless clubs. And now there's a new excuse for a golfer. "I'm outta ammo." You know you have to try swinging the swingless club and get the timing right so you fire the charge upon contact, right? That's the first order of business and you know it. I wonder if Anton Chigurh would have used one of these instead of the captive bolt pistol he was so fond of. In the latest make-fast-food-look-healthy campaign we have the Taco Bell Drive Thru Diet. In the commercial we meet a woman identified as Christine Dougherty who is to Taco Bell as Jared Fogle was to Subway. Both slimmed down while eating at their respective fast food restaurants. Christine's weight loss is fantastic, but to attribute it only to Taco Bell food is very misleading. A host of caveats as long as some drug ads follow her story: Christine’s weight loss was “exceptional” according to the commercials, her taco bell trips were part of a larger effort to cut calories down to 1250 a day, and the Taco Bell Drive Thru Diet shouldn’t be considered a diet. Right or wrong, diet and public health experts agree Taco Bell’s new campaign will likely seriously influence Americans who spend a great deal on fast food from their cars each year. Although the line of “Fresco” burritos and tacos has existed for six years, the upcoming weeks will be the first time the majority of Taco Bell customers will see the low fat options on the menu. That's right, folks. It's not a weight loss program. But by using the word "diet" they're trying to fool a lot of people who either won't read or pay heed to the fine print. Nor will people consider the lifestyle change they really need to make in order to be fit and healthy. Call it diet theater. "I'm eating [insert latest fad food here] and I've lost two pounds so far." Yes, but have you noticed that after all the diets you've tried over the years you still haven't changed? So based on the average of 1250 calories a day, if Christine only ate at the drive thru window, then according to the nutritional guide she could eat eight Fresco Crunchy Tacos every day. Or three Fresco Burrito Supremes (chicken or steak). Or three Fresco Bean Burritos. Her favorite is the Fresco Ranchero Soft Taco. She could eat seven of those a day. Now for all I know she may have augmented her "diet" by drinking water instead of soda and flexing her quads and alternating the foot she used to press the brake pedal while waiting in the drive-thru line. That's how all killer bods are made. Well, that and exercise and eating right in the first place. And maybe even Photoshop. From an article in the San Francisco Chronicle we have a Ninth Circuit ruling allowing Carl Bryan's case against a police officer to proceed for using excessive force (a TASER). The decision by the Ninth U.S. Circuit Court of Appeals sets judicial standards for police and for people who claim they were victims of excessive force after police hit them with a Taser dart. "The objective facts must indicate that the suspect poses an immediate threat to the officer or a member of the public," Judge Kim Wardlaw said in the 3-0 ruling. Though stun guns may offer a valuable, nonlethal alternative to deadly force in defusing dangerous situations, Wardlaw said, they inflict a "painful and frightening blow" and must be used only when substantial force is necessary and other options are unavailable. Bryan was stopped for not wearing a seat belt. He was agitated and acting bizarrely but was never a threat to the officer. The officer used his TASER and Bryan landed face first on the pavement and breaking four teeth. You can read the entire story and the ruling here (PDF) on the Ninth Circuit's web site. Here is the security directive the Transportation Security Administration released on Dec 25. It applies to flights originating outside the U.S. coming to the U.S. and is effective until Dec 30. Joe Tex was The Rapper, a name which came from the "talking portion" of many of his songs. I don't remember hearing about rap until the 80's. The BTO album with these notes came out in 1973. Good boy that I am, I was the lucky recipient of a Nikon SB-600 flash for my camera. Kathy looks loving at a most "interesting" gift given to her by my sister Judy. Don't you wish you had one? A sister, Judy, I mean, who would bestow upon you such treasures as have never been seen before. Don't let Geoff's professional look fool you. He thinks you're supposed to shoot like this for every shot. After blinding Steph with this shot she blamed me for missing hers. Here's Josh using his Jedi mind tricks to throw his opponent off by causing the ball to hover in mid air. It was a blatant foul and called as such. I noticed this advertisement posted above a gas pump and it just seems wrong in so many ways. As more details come out about the man who tried to blow up a plane as it approached Detroit, it's interesting to see what security measures have been implemented and will be implemented in response. Federal authorities have called on airlines and airports around the world to tighten security measures, including frisking all passengers headed to the U.S., performing additional searches and limiting passenger movements during the latter part of a flight. The new guidelines limit on-board activities by passengers and crew members while in U.S. airspace. Among other things, passengers must remain in their seats during the last hour of flight and cannot have access to their carry-on items or place any personal belongings in their laps. That's all well and good, but notice that this man tried to use the same explosive material (pentaerythritol tetranitrate) that Richard Reid, to whom we owe our barefooted screening procedures, tried to use. So rather than screen for or detect PETN we remove our shoes. After all, there's no place else you could hide PETN. Until now. When police discovered a plot involving the manufacture of triacetone triperoxide on aircraft in order to destroy them, rather than consider how unlikely the plan would succeed, we were restricted to three ounce limits for liquids and gels. 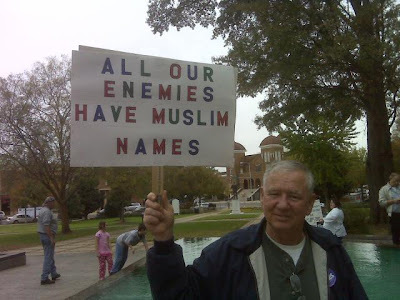 However, you'll find there are exceptions for which no terrorist would dare use for their nefarious purposes. * Gels or frozen liquids needed to cool disability or medically related items used by persons with disabilities or medical conditions. Put a black hat on and the possibilities are mind boggling which makes it a seemingly impossible task for those in the prevention business. Hence the security theater we are forced to play our part in every time we fly. Some passenger reactions were also in the L.A. Times article. The new measures were noticed Saturday by Diane Sen, 23, and Neill Dass, 24, of Portland, Ore., who spent their honeymoon in Fiji. Before boarding their overseas flight to LAX, they said, they were screened three times and saw extra staff and dogs patrolling Nadi International Airport. Sen said she did not mind the additional scrutiny and the thorough search of her carry-on bag. "The more we have, the better we feel," she said. And that is precisely the point of security theater. 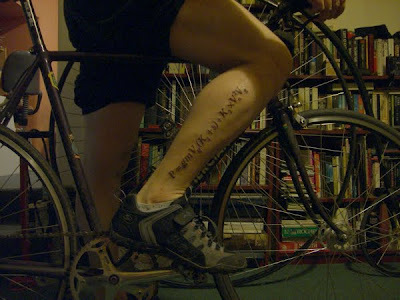 I was checking out science tattoos--no, I'm not seriously thinking about it--and found one containing an equation for powering a bicycle. Hey, if you're going to get a tattoo, you might as well get something useful, right? Or you could buy the book instead. The book is probably cheaper than the tat. Every year I guess the amount to put in my flexible spending account for the health care costs I'm pretty sure will take place in the coming year. This is a great tax savings benefit in that the money that goes into this account is deducted from my salary and I don't pay taxes on it. The downside is that if my guess is too high then I lose whatever money I haven't used by the end date. If my guess is too low then I pay for it using money that is not tax free. One expense category covered by the flex spending is over the counter drugs. It's not a lot compared to everything else, but acetaminophen, ibuprofen, nonprescription allergy meds, etc., can add up over the year. It turns out that might go away because both the House and Senate version of the health care reform bill remove it. Both bills restrict individuals with these [flexible spending accounts and health savings accounts] pre-tax accounts to buying a “medicine or drug only if such medicine or drug is a prescribed” one. And ironically, this tax that will raise health care costs substantially by creating incentives for the use of more expensive prescription drugs even when OTC drugs are just as safe and effective. I will let Congresswoman McMorris Rodgers and Senators Murray and Cantwell know where I stand on that. Sometimes I wonder why, other than child care being much more expensive, I bother sending my children to school because it seems they don't learn much that's really useful outside of science and math and the usual stuff. I'm talking about the stuff you need to know for Jeopardy! or trivia night at a bar. I happened to mention to my son, the cross country runner, that Alice Cooper ran cross county in high school, too. "Who is that?" he asks. "You've never heard of Alice Cooper, the rock star or the band? How about the songs 'I'm Eighteen' or 'School's Out'?" I ask. His face lit up. "Oh, 'School's Out'. That's on Guitar Hero. I can play that pretty good, too." Kathy has been carrying two cell phones for over a year now. One is the phone she uses, currently with T-Mobile, and the other, formerly with Verizon, contains all her contacts. Back when she left Verizon, the T-Mobile tech was unable to transfer her contacts from her Verizon phone. (It did not have a SIM card.) Rather than endure the tedium of re-entering all her contacts, she elected to just carry both phones. Some contacts were lost through attrition. Some were transferred by receiving calls from them. And some she had to look up on the old phone and type into the new phone to call. So I got Kathy a new phone for Christmas. The tech at the T-Mobile store was exceptionally helpful and managed to transfer all contacts from both old phones onto the new one which made Kathy very happy. Plus, the keyboard on this phone makes sending text messages to Josh a lot easier, much to his chagrin. Apparently there's a teen requirement that says you're only supposed to text with people of your own age group or something. Josh, not the most verbal person in the world, rarely answers his phone, but he will answer text messages. Well, mom just wants to communicate with her son. P: "Did you say five-five-nine-four-five-eight-three-four-five-two?" P: "Did you say five-four-nine-four-five-eight-three-four-five-two?" Now Josh offers some advice. "You're supposed to say 'zero' instead of 'oh'. Just tell it to call Hank." P: "Did you say call doctor (name starts with "H")?" P: "Did you say call (randomly selected name)?" P: "Did you say call (still another wrong name)?" volume of her voice and moving the phone closer to her mouth. P: "Did you say call (randomly selected name from contact list)?" P: "Did you say call (another randomly selected name from contact list)?" P: "Did you say call Hank Greer?" Kathy screams in frustration giving me and Josh a good reason for busting out laughing. In what some folks might list under the category of Unmitigated Gall, Bradley Thoma files a $4 million claim against the City of Spokane for wrongfully firing him. Bradley N. Thoma, 44, was fired Monday after refusing an offer from Chief Anne Kirkpatrick to accept a layoff and be eligible to be rehired as a detective if he completes a court deferral program for his drunken driving charge. That offer came after Kirkpatrick ruled that Thoma was unable to work as a police officer under the court program because it requires him to have an ignition interlock device on his car. But that decision was wrong because it didn’t consider Thoma’s alcoholism as a disability, said Thoma’s lawyer, Bob Dunn. If there's a video I would be keen on shooting, it would be of Sgt Thoma starting a police cruiser by blowing into the ignition interlock device. What an excellent way to reinforce the Spokane Police Department's notoriety as exemplified by the events involving Otto Zehm, Shonto Pete and Josh Levy. Now according to Thoma's attorney the city could only be more unfair by firing someone who has cancer. There's no need for someone to start a fund raiser because he's already doing that to the tune of $4 million. So who will start the prayer chain for Bradley Thoma? There has been a lot of news about the order concerning women military members getting pregnant, and military men impregnating them, while serving in Iraq. So far a few women and men have been punished. Maj. Gen. Anthony Cucolo, who commands Multi-National Division — North, said he instituted the ban when he took over in early November to prevent the loss of valuable female soldiers, since troops who become pregnant are sent home. What the general has succeeded in doing is raise the awareness of this issue, but he has also tied his hands when it comes to punishing those who violate the order. Essentially, a woman assigned to the war zone who becomes pregnant will receive a letter of reprimand and nothing more. Why? Because the next step up is non-judicial punishment administered under Article 15 of the Uniform Code of Military Justice. The use of non-judicial punishment allows a commander some leeway in prosecuting someone who violates the UCMJ, in this case, something along the lines of failure to obey a lawful order. A military member can lose pay, be demoted to a lower rank, be assigned extra duties, etc., but still remain assigned to their unit and perform their primary duties. It gives the punished person an opportunity to redeem themselves to some extent and the unit still has that member on board. The catch is the when a military member is offered Article 15 punishment, they have the option refuse it and be court-martialed instead. Since the general stated he will not court-martial anyone for this, then the women who become pregnant can quite likely bank on getting nothing more than a letter of reprimand which will have little effect on their careers. That doesn't mean other circumstances can't prevail. Adultery is an offense under the UCMJ. It's a rarely prosecuted offense, but that is a possibility in cases where adultery is involved. One article mentions a male non-commissioned officer was charged with fraternization and given a letter of reprimand. I don't know about that. Fraternization is an offense committed by an officer fraternizing with an enlisted member. But Article 134 of the UCMJ can be used to prosecute anything that leads to the prejudice of good order and discipline. On the bright side the general has, whether purposely or not, created a lot of publicity which will hopefully lead to some meaningful dialogue to address the issue women military members who voluntarily become pregnant while serving in a war zone and thus make themselves unavailable for duty in that zone. This is the first I've heard of The Skeptoid so I can't address his writings, but he does have an interesting post about barefoot running. And he approaches the subject with skepticism which is a good thing. That evolution has made us into bipeds that walk and run barefoot across the savannah is not a perfect argument that we're well adapted to do so. There are many examples in nature of creatures who evolved detrimental traits. The giraffe's laryngeal nerve runs all the way down its neck into its chest, loops around its aorta, then runs all the way back up to its larynx; making it absurdly long and prone to many types of failure. The Irish elk developed antlers so large that the energy required to grow them exceeded the available food sources and the species became extinct. The mating ritual of the Kakapo flightless parrot is more likely to attract a predator than a mate. The retinas in all vertebrate eyeballs are inside-out, creating an unnecessary blind spot. The list goes on forever. The point is that evolution does not create perfectly adapted creatures; it creates adequate creatures. Funny he should mention the laryngeal nerve in giraffes. The bizarre path taken by the laryngeal nerve is true for all mammals, including humans. It's just more pronounced and noticeable for giraffes since their necks are so long. I have no idea what failures of the nerve he's referring to. I've never read anything about that nor can I find anything on the subject. But he does make one good point, that being evolution does not create perfectly adapted creatures. But enough about evolution. The article is about barefoot running. The lack of hard data means we really don't know if it's better or not for you. But I can say that it works for me. Last Sunday while speaking on the floor of the Senate, Senator Tom Coburn of Oklahoma suggested to Americans that they should pray that someone couldn't make the vote on the health care reform bill. "What the American people oughtta pray is that somebody can't make the vote tonight," Coburn said. "That's what they oughtta pray, so that we can actually get the middle -- not me, not mine, I understand I'm way over here -- but we oughtta get the middle of America and the middle of the Senate a bill that can run through this country and actually do what we say we all want to do." Well, one senator did miss the vote. Senator Jim Inhofe who is also of Oklahoma. So this morning someone calls in to C-SPAN and asks Senator John Barasso, Wyoming, if their prayers backfired and killed the wrong man. "Our small tea bag group here in Waycross, we got our vigil together and took Dr. Coburn's instructions and prayed real hard that Sen. Byrd would either die or couldn't show up at the vote the other night," the caller said. "How hard did you pray because I see one of our members was missing this morning. Did it backfire on us? One of our members died? How hard did you pray senator? Did you pray hard enough?" Every once in a while I look at my spam folder to see if I got anything other than the usual ads for improving my "performance", discount drugs, etc. 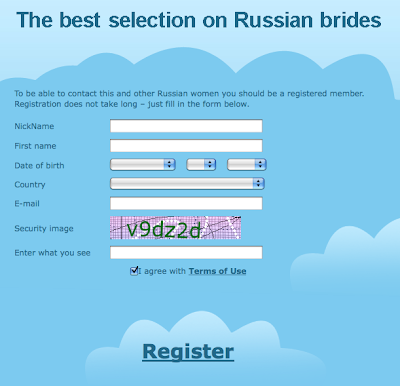 Today I received one informing me there were Russian brides to be had. Since that went so well for me the last time, I just had to take a look. The main page displays some of the brides I can choose from. Checked for what? I can only wonder. After my experience last year I have a fondness for the name Daria so I clicked on her picture. What a shame I'm out of her desired age range. But maybe I can convince her that age doesn't matter. How funny that the spammers use a security feature to keep spambots from registering and posting their spam. I wonder what kind of spam spammers get. In a press release yesterday, Senator Jim Webb of Virginia gives an excellent overview of how the health care reform bill effort reached its current state. Over the past year, the process of debating this issue often overwhelmed the substance of fixing the problem. The Obama Administration declared health care reform to be a major domestic objective, but they did not offer the Congress a bill. Nor did they propose a specific set of objectives from which legislation could be derived. Consequently, legislation was developed independently through five different Congressional committees, three in the House and two in the Senate. This resulted in a large amount of contradictory information and a great deal of confusion among our public. So while we can point fingers for stalling, flip-flopping, boorish behavior, imprecatory prayers, outright lies and holding out for whatever reason, as Senator Webb points out, the blame for the part good and part bad health care reform bill passed by the Senate can be spread all around. No public option. No expansion of Medicare. And to reduce the cost, some parts don't take effect for a couple of years. Last week Glenn Greenwald offered a plausible explanation of how the Obama administration pretty much got what it wanted. Even though it's not over yet, I'm pretty disappointed. A woman riding the STA 124 this morning enlisted the help of several other passengers. She called her son on her cell phone and everyone sang "Happy Birthday" to Justin. It also lightened up the mood for everyone on a rainy Monday morning ride to work. 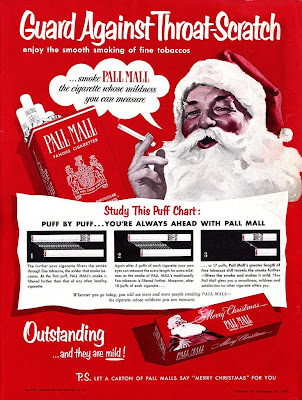 Keep your hands out of Santa's pants. 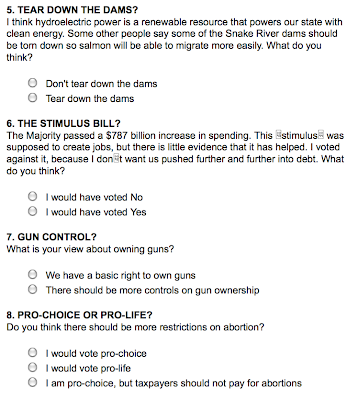 Cathy McMorris Rodgers has a constituent survey for us to take. While I appreciate her asking for feedback, she presents issues as if they are clearly black and white and doesn't take any nuance into account. Have a look. I get the impression she's looking for validation for the positions she took on her bailout and health care reform votes. Afghanistan is far more complicated than choosing between increasing and withdrawing troops. "Some people say" is a phrase overused by politicians and cable talking heads. It's a way to insert an argument without any attribution. I think we can own guns and have more controls over them. These two positions are not exclusive of each other. "Do you think there should be more restrictions on abortion?" As if there aren't enough already. 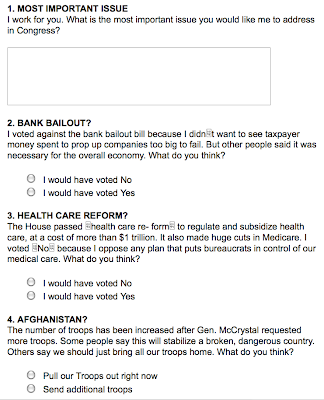 But the choices not only leave out the gray areas in between, they don't really answer the question. 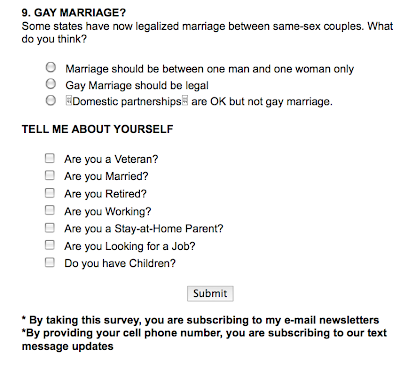 The gay marriage question seems to be the only straightforward question on here. In true free market spirit by providing your email address you agree to sign up for email notices. Not a big deal. But I'm not providing a cell phone number so I can pay for receiving text messages from the good congresswoman. I can't think of anything that requires that sense of immediacy and urgency. Some of the more recent methods adopted by law enforcement agencies across the country come across as a little too intrusive for some people's taste. But hey, if you're innocent you don't have anything to hide, right? In its monitoring of photo red cameras, the Chicago Tribune published a story yesterday about how little, if any, effect the cameras are having on safety. If improved safety is the goal of red-light cameras, then it is a mission largely unaccomplished for the first crop of area suburbs that raced to install the devices after they became legal in 2006, according to state data. Accidents rose -- in some cases, significantly -- at half the 14 suburban intersections outfitted with traffic cameras by the end of 2007, the data show. The number of crashes fell at just five of those intersections after cameras went in, while two showed little change. The most striking results come from Oak Lawn, which in September 2007 switched on cameras at the very busy junction of Cicero Avenue and 95th Street. In 2006, before cameras, that intersection was the scene of one broadside crash -- the dangerous type of collision that cameras are said to be most aimed at reducing. By 2008, with cameras, the total of broadsides had risen to five. Overall, the number of crashes of all types rose from 34 in 2006 to 44 in 2008, according to state data. Roger Pawlowski, a division chief at the Oak Lawn Police Department, said the benefits of red-light cameras can't always be extrapolated from crash statistics. The suburban crash numbers, compiled by the Illinois Department of Transportation from local police reports, reflect a similar accident trend as that found in state data on city intersections with cameras. The Tribune reported last month that IDOT records showed collisions either increasing or holding steady at nearly 60 percent of the 47 city intersections equipped with red-light cameras in 2006 or 2007. I wonder how that's working out for Spokane. The last I heard, city officials were thinking about adding photo red to some other intersections, but according to the Spokane Police Department site that hasn't happened yet. The Inlander did a story just last September after the cameras were in place for a year, but the city didn't offer up any evidence to indicate improved safety. But they are making money. So don't support Photo Red--drive safely instead. As discussed over on HorsesA$$, is Washington State's tax structure unfair to the poor? Have a look at the chart from a report issued by the Institute on Taxation and Economic Policy and see what percentage of your income goes to to the state. If you make $20,000 a year, you pay 17.3% which comes to $3460 in taxes to the state. If you make $500,000 then you pay 2.9% which is about $13,000. The median income (PDF) for Spokane County is roughly $43,000 which gets tagged at 10.8% for about $4644 in taxes to the state. I'm not here to justify our tax system, but I do have an observation to make about this. 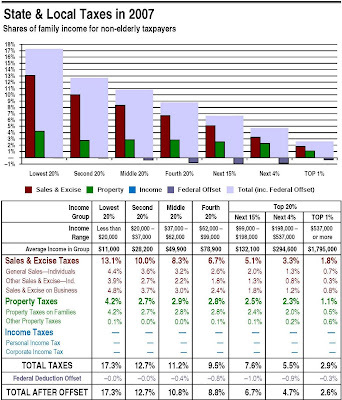 If you examine only the percentage rate, then those in the lower income levels seem to have a greater tax burden than those with higher incomes. But if you look at how much is being paid, you'll see that those with higher incomes are actually paying more. The trick is determining a fair rate for everyone regardless of income and that is beyond me. One other observation. Since Washington does not have an income tax, I can either compute a sales tax deduction every year on my federal income tax or save my receipts for the year and claim the total state and local taxes. One year I saved all my receipts and I was better off taking the computed deduction based on my income. However, the amount computed by the IRS, as well as the amount from my receipts, is far lower than the amount listed on the above chart. As it is, Washington and other states benefit from another lucrative method of taxing the poor. Whose world could you change? Indeed. Remember when you were a child and your parents talked about an historical event they lived through but for you it sounded like ancient history? You couldn't relate to it other than what you'd read or heard about and it just seemed so far in the past. As a child I remember hearing about the Korean War from a neighbor who served in the Army there. A number of soldiers were in formation when an officer asked for volunteers to be ambulance drivers. He figured that should be a safe job and stepped forward only to learn that the Army doesn't necessarily work in ways you might expect. He drove an ambulance all right, but it was on the front lines. His Purple Heart informed me had been wounded in action but he never told me the particulars of the events that led to that. Maybe he thought a 15-year-old didn't need to hear about that. But here he was telling me about something that happened before I was born and while I was interested, I also remember thinking he was soooooo old. Well, what goes around comes around. With the power of Google Maps at my fingertips, I take the opportunity now and then to look at places I've been or lived. For example, there a tiny, corner-lot house in Topeka that brings back a rush of memories for me. I coasted down that driveway after my dad gave me a push and he watched as I rode a bike for the first time and in a panic ran into the back of a neighbor's VW van. But I digress. While doing a little research about Hellenikon AB, Greece, a base I transferred to in the summer of 1977, I learned it was closed in 1990. I was taking a look at the area using Google maps but I was having difficulty finding it. The base was connected to the Athens airport near Glyfada but the airport was no longer on the map. Digging a little deeper I found that the airport was closed after a new one was opened and the former base, along with much of the adjacent area, was the location of several venues for 2004 Olympics. I mentioned this bit of trivia during dinner last night and Josh, in a convincing act of being impressed, said, "Whoa, you were at the Olympics." "Yep," I said, "Twenty-seven years before they happened." "That was like back in the 80's". "Um, 1977," I informed my son whose impaired subtraction skills apparently don't affect his Calculus grade. "Of course, all that sounds like ancient history to you guys, huh?" "Yeah, Dad remembers the first moon landing," Josh informed Stephanie. Not realizing I was making matters worse, I piped up with, "Heck, I remember the Mercury and and Gemini launches." Steph shook her head and sadly informed me, "You are soooo old." So that's where I am on the day I reach 53 years of age...soooooo old...but damned if I feel like it! A four-layer cake courtesy of Kathy and Steph. Tiger Woods is named the Associated Press athlete of the decade. So what? Just like all the other stars in all the other sports, Tiger Woods has had absolutely no effect on my life. Professional sports are just another form of entertainment. Entertainment stars are rarely models for us to emulate yet we place them on pedestals because of their skills, regardless of the type of person they are, and we seem to have the same expectations of them as a person as we do of their special talent. Then we are disappointed when they fail us but at the same time their transgressions allow us to feel superior to them. We knock them down to size and kick them in disgrace for being disgraceful. With our righteousness validated, we turn to fawn over the next superstar. The Northwood 8th grade choir held their Christmas concert this evening. The kids have improved immensely since their fall concert. They sounded great. Yes, that's Stephanie sporting her newly adjusted braces with maroon bands. Today's run wasn't nearly as pleasant as Monday's but more so than yesterday's entirely shod snowbound slip 'n' slide struggle through Browne's Addition. I followed the Centennial Trail for a mile and a half and was pleased to see much of it was clear of ice and snow. Since it was about 40 degrees, I removed my shoes for the return trip and it went pretty well as long as I avoided the puddles of water. The cold combined with the wet tends to make my soles more sensitive. On the bright side that forces me to focus on proper technique. Ya gotta look at the bright side, you know. But trouble found me when I got to the Looff Carousel and hit a minefield of snow melt crystals that hadn't melted yet. It's like someone put down just enough to make me uncomfortable and yet, in a crafty and diabolical plan, increased my discomfort by not giving me any blank spots to step in. And to top it off, the crystals are sharp so they stuck to my wet feet long enough to allow me to feel the stabbing and poking repeatedly before the ornery gravel-like bits fell away. It reminded me of something Geoff--age 5 at the time--did when he offered Kathy and me some advice after our house in Montgomery, Alabama, was burglarized. "We could put nails in the back yard and when the bad men came (lifting each foot like every step was painful) they would go, 'Ow, ow, ow, ow'." I broke out in itchy bumps yesterday after dinner and Kathy diagnosed it as an allergic reaction. I ran through everything I ate yesterday and the only thing that was out of the ordinary was some cookies made by one of the ladies at work. I had eaten these cookies on other occasions so I was doubtful they were the cause. A dose of Benadryl set things right. When I got to work this morning, I decided to try some of the cookies and see what happened. Nothing. At lunch I went for a run and then I ate the pasta I had leftover from the night before. Not long after that I broke out again. Fortunately, a coworker had a dose of Benadryl on hand so I didn't have to tolerate the itching. Now the pasta and sauce was suspect in my book. I told Kathy about my experiment and she was flabbergasted. "You ate the cookies on purpose to see if you would have an allergic reaction?" "And you did this without taking any Benadryl with you?" "Do you know that the allergic reaction normally gets worse each time you're exposed to the allergen?" "Do you know this was quite likely a delayed reaction from the cookies?" "Do you think it's smart to endanger your health by experimenting with something you're allergic to?" And with a look that said she would not take no for an answer, "You're putting this on your blog, right?" The Charge of the Light Brigade by Lord Alfred Tennyson is a poem that honors the soldiers led in a misdirected cavalry charge because of a miscommunication. For me the poem brings out the folly of following orders without question as well as the tragedy and waste of war. The general, the Earl of Cardigan, who led the charge survived. With 118 of his men killed and 127 wounded, Cardigan didn't bother to find out what happened to those who survived. He left the field and returned to his yacht in the harbor. Shamelessly stolen from Talking Points Memo. With that in mind, I'm certain Congresswoman Michelle Bachman has no clue about her reference to The Charge of the Light Brigade. And from the cheers, I believe the crowd is also unaware that the brigade was senselessly led by a general who did not care what happened to those who followed him. The unnecessary sacrifice prompted French Marshal Pierre Bosquet to note, "It is magnificent, but it is not war. It is madness." small sum of money as 20-100 dollars. technologies in production and delivery of pipes for oil and gas. companion who uses your savings in a right way - that`s the AimTrust!. According to McAfee they don't try to download malware from their web site. BizInformation, whatever the hell that is, values the site at a cool million dollars. There's a discussion forum hosted on hyip.com which lists AIM TRUST ONLINE as a premier HYIP and states "AIM Trust is a financial company working in the metal market, and opened for small cap investors." The metal market? But the email said pipes for oil and gas. I'm sure that's an honest mistake. There are comical posts from Jane--well, one of them--from AIM TRUST. "She" goes by "Sincerely yours, Jane." 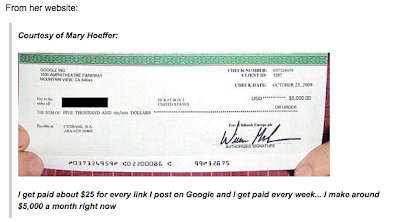 Sprinkled in between are posts that claim to be satisfied customers like "TH" and "EliteTrader" that, in a weak attempt to make AIM look legitimate, have some complaints but are still making money regardless. "TH" even provides easy to fake images as proof. BTW, HYIP is a high-yield investment program. It's an excellent way for you to make money...disappear! With apologies to Bachman-Turner Overdrive for trashing their song. With yet another get rich scheme. If you just gimme your money please." They said, "Gimme your money please." So I may resort to using CAPTCHA to thwart the evil spambots. I took the last five days off from running because I was feeling under the weather. Feeling much better after a full day's rest from the lame party, I was looking forward to my lunchtime run. It felt great. I headed out for a four-mile trek to and from Mission Park. According to the National Weather Service the wind chill was bringing the 25 degree temp down to 18 and I felt it during the first two miles going into the wind. There was just a powder of last night's snow left in spots on the Centennial Trail. After turning around there seemed to be less of a wind so I did what any other sound-in-mind-and-body, sober runner would do. I took my shoes off. I ran for a mile with a light snow coming down, sucking in an odd flake now and then. One errant flake caught me in the eye. Did you ever notice that the world seems quieter during a snow fall? Maybe it was all in my head but that seems true even in a sparsely falling snow. I suppose I could attribute the silence to my bare feet lightly touching down on each step, but running as quiet as the breeze along the trail was absolutely the most enjoyable part of the run. I would've loved to continue without shoes all the way back but the reality of the weather reminded me not to do anything stupid. Although three of my toes were complaining of the cold, the soles of my feet felt fine. So I put my shoes and socks back on and thap-thap-thapped the last mile back to the office. Yeah, I'm like that all the time. Last night we hosted a Christmas party for the nurses Kathy works with. It was an enjoyable evening capped off with a White Elephant gift exchange. Among the "best" gifts were a vibrating finger-shaped pen that farted when you pulled it, providing fuel for infinite innuendo, and a most hideous looking owl. Kathy made up options for people who wanted to trade their gift for someone else's which added to the fun. At the end of the trading she ended up with the owl. I think we should let it keep watch over the back yard from the top of the pergola. Maybe it'll keep the neighbor's cats out. The most interesting observation about the party came from Steph who was upstairs the entire time. During the gift exchange she sat at the top of the stairs and listened. The verdict: We are lame. and using Google got these results which include a lot of news-looking pages which have "ADVERTISEMENT" or "ADVERTORIAL" (huh?) in small print. Here's a few screenshots of that same comment. 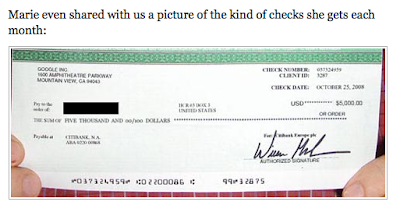 And there's even pictures of checks from real people. Some of these pages have even more links to other get rich quick scams. The one they picked, the one you'll know by. An article in the Times Online in England provides a reminder of the one-sided perceptions concerning what our youth learn from us. Nursery-age children should be monitored for signs of brainwashing by Islamist extremists, according to a leaked police memo obtained by The Times. The police unit confirmed that counter-terrorist officers specially trained in identifying children and young people vulnerable to radicalisation had visited nursery schools. Targeting young children is very important. As a child I was taught black people were lazy, Jews were cheap and Indians were drunks. One common characteristic that these and other meritless "lessons" were that none of them applied to the group of people I was a part of. Among the "lessons" for today we hear that all Muslims are terrorists, homosexuals are out to destroy marriage, Intelligent Design is a science and the science of climate change is a hoax. The more things change, the more they stay the same, eh? 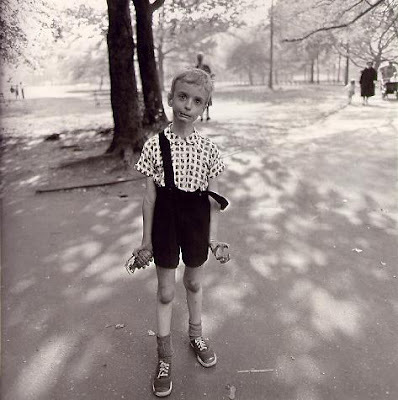 Teach Your Children Well was written by Graham Nash and presumably inspired by the above photo. The name of the album it was released on: Deja Vu. About 897 miles (1445 kilometers) away in Hawaii, the electromagnetic pulse (EMP) created by the explosion was felt as three hundred street lights failed, television sets and radios malfunctioned and burglar alarms went off. On Kauai, the EMP shut down telephone calls to the other islands by burning out the equipment used in a microwave link. While some of the energetic beta particles followed the Earth's magnetic field and illuminated the sky, other high-energy electrons became trapped and formed radiation belts around the earth. There was much uncertainty and debate about the composition, magnitude and potential adverse effects from this trapped radiation after the detonation. The weaponeers became quite worried when three satellites in low earth orbit were disabled. These man-made radiation belts eventually crippled one-third of all satellites in low orbit. Seven satellites were destroyed as radiation knocked out their solar arrays or electronics, including the first commercial relay communication satellite ever, Telstar. Detectors on Telstar, TRAAC, Injun, and Ariel 1 were used to measure distribution of the radiation produced by the tests. Crazy stuff. Back in 1987, while staying at a bed and breakfast near Edinburgh, Scotland, Kathy and I had the good fortune to meet a Mr Clark. Most likely you've never heard of or met Mr Clark, but you're probably familiar with men like him. He was a veteran of World War II, retired British Army, a non-volunteer atomic test participant, and a Scotsman with a farm on Tasmania who visited his homeland once a year thus crossing our paths. His crushing handshake belied his age of seventy. He and I spoke at length after dinner. I was blown away to hear his tale of being at the site of an atomic test. I don't recall all the details and I can't account for the veracity of his story but I do know there were British troops exposed to various atomic tests back in the 50's. I had recently read a book entitled Killing Our Own documenting American military members' exposure to radiation, the medical effects of the years, and our government's, to put it politely, inadequate response. And here I was hearing it straight from someone who'd been there. Mr Clark had no complaints. He did as he was ordered and he said he was willing to do so because he feared communism. He spoke at length of the terrible specter of communism that, although diminished in 1987, still haunted the world. As far as he was concerned, any sacrifice was justifiable to ensure its defeat. And so, in a similar vein, we continue. John and Jacque checked in with their experiences with the ads I was complaining about. I pulled up The State at work and got these two copies of the ad. Since the outgoing address of our gateway is assigned to an entity in San Francisco, guess where the ads claim to be from. So I had an idea. I looked at their contact information and wrote Gary Ward who is the Online Editor. I'm writing to you because you are listed as the Online Editor for TheState.com. If this inquiry is improperly sent to you, I would appreciate it if you would let me know who it should be addressed to. I am concerned about two advertisement blocks on home page of TheState.com. One is roughly in the center of the right side of the page and is labeled "Ads by pulse360". The ad sometimes appears at the top of the home page as well as other pages. The second ad often appears on the bottom left corner of the home page and is labeled "ads by locked on". Both of these ads are curious because it appears they do a reverse lookup of the reader's IP address and create the ad based on the location the IP address is assigned. 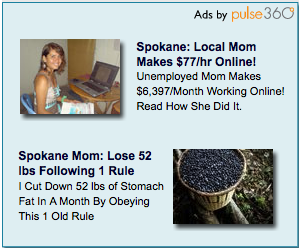 For example, I live in Spokane, Washington and the ads prominently display "Spokane: Local Mom makes $77/hr Online!" 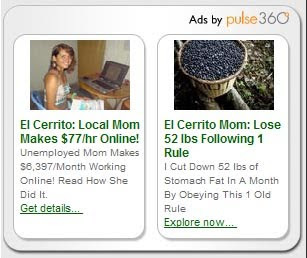 and "Otis Orchards: Mom Lost 48lbs Following 1 Rule". Otis Orchards is a community nearby Spokane. I've attached the images of the ads that I captured off the site. When I access TheState.com from work I go through a gateway located in San Francisco. Consequently, the ads display similar claims but now they substitute "El Cerrito" for "Spokane" and "San Francisco" for "Otis Orchards". El Cerrito is across the San Francisco Bay from San Francisco. As you can see from the images, all of the ads present the same picture and make the same claims. I suspect that if you view your home page from your home, the ads would reference your locale in South Carolina. I find this very misleading and I have two questions. Are you aware your site is engaging in this practice? What is your position on the ethics of such advertisements being placed on your site? Mr Ward informed me "I have forwarded your e-mail to our VP of Interactive". Thank you so much for your interest in thestate.com. The practice of localized ads is used in television and in radio as well, where regional/national ads are altered to better fit the geographic location of the audience. The ads you’re referring to can be found on news and information websites across the country. Thanks again for your interest in thestate.com, all the way from Seattle. No direct answers to my questions and very much an unsatisfactory response. Basically, everyone else is doing it so we are too, and thanks for checking in from Spokane Seattle. I touched on this subject last May but I didn't dig into it much. So this time I used the Google and found an article from last April and one from last May that make for some interesting reading. 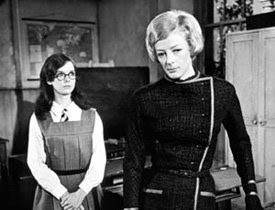 I recently watched The Prime of Miss Jean Brodie, a movie I was completely unfamiliar with. It was released in 1969 and Maggie Smith won an Oscar for Best Actress in a Leading Role in 1970 for her performance. Yes, the same Maggie Smith who plays Minerva McGonigall in the Harry Potter movies. The story and acting aside, one thing that stood out--and Josh was the first to make this connection--was that Jenny, a student and trusted confidante who betrays Miss Brodie at the end, looks like a female version of Harry Potter but minus the scar. Purely an observation of coincidence not intended as a basis for choosing whether or not to trust an adolescent who dons black-framed, rounded lense spectacles. Look for the scar instead. I never click on them but these ads bother me a little. They look up the IP address your are connected from and insert the name of a city you are in or nearby to make it look like someone near you lost a bunch of weight or made a ton of money presumably to give you the idea that maybe you could do the same. Clicking on the ad probably generates some income for the site, in this case The State newspaper in South Carolina. They're not unique to that site nor are they just on newspaper sites. I wonder if this would qualify as an FTC complaint. After all, if the name of the city is changed based on where you are accessing the site from and the ad continues to make the same claim, shouldn't that be false advertising? I realize that newspapers are suffering from declining print subscriptions, but is this an ethical way to make up for it? Spokane County, and we residents, are in for a rough patch. As Jim Camden of the Spokesman Review pointed out in a recent article, the county must trim $10.5 million from it's budget in order to break even. That's about $22 for every man, woman and child that comprise roughly 467,000 county residents. Camden provides an online copy of the county's budget so anyone can try balancing the budget so I thought I'd take a look. Well, it ain't lookin' good. A huge majority of the budget goes towards maintaining law and order: the Sheriffs Dept, prosecutors and defenders, the jail, court operations, juvenile detention, etc. Making cuts there would be seriously detrimental to an already overloaded system. On the heels of the annexation agreements by Spokane and Airway Heights, come January 2012 the county loses another 1.8 million of tax revenue without a corresponding reduction of people to provide services to. Yesterday, the county released the planned cuts and it still ain't lookin' good. If the city of Spokane plans to keep pushing its borders outwards and taking away more of the county's tax base in the process, then maybe it's time to take a serious look at combining the governments. 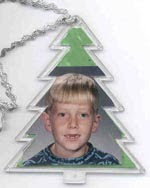 Decorating the tree every Christmas provides an opportunity to refresh my mind of the time that has passed, an annual exercise in recall made more difficult by the year that just preceded it. 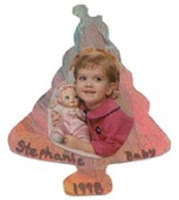 Various ornaments create "Hey, remember when..." moments that bring back times that don't seem as aged as they are. "Our First Christmas" back in 1980 alludes to the spartan beginnings Kathy and I had as a young married couple, too happy to care just how spartan our beginnings were. The remaining few homemade stained glass-like ornaments we made together for our second--or was it our third?--Christmas are watched over carefully for fear they may disappear like their brethren, most likely still hidden in the branches of discarded trees. Three "Baby's First Christmas" with the respective birth years call attention to the books and educational toys that were going to help us make our children so smart only later to learn they were always at their best when their imaginations were loosed. Ornaments unique to the places we have lived and visited point out the travels we have made and the cultures we have enjoyed. And topping them off we have the various ways to frame the elementary-aged gap-toothed forced smiles, the obligatory annual school picture documenting the slow growth that now seems to have occurred so quickly. Among the decorations is a stocking I had has a child. It's zig-zag stitching around the green felt still holding strong while my red-markered name on the white cuff, in an uncomfortable foreshadowing of the inevitable, fades a little more each year. The stocking is a reminder of Christmases past when I and two brothers--the three oldest--would stealthily slip out of our bedroom and impatiently wait for our siblings and parents to wake as we almost silently examined the presents surrounding our humble tree. Real football uniforms complete with pads, pants, jerseys and helmets so that my brothers and I, still younger than ten, could mimic the pros we watched play in between Falstaff beer commercials and halftime marching bands. Once it was a bicycle that expanded my horizons and showed me a huge world existed beyond my neighborhood. Another time, a chemistry set with which I could stray from the instructions to create the most unpleasant odors and even endanger the house and family. 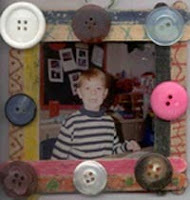 Second grade for each of my children seems so long ago and in comparison my elementary school years are ancient history. Years from now, what memories will be awakened in my children and what stories will they tell about the tin can they sloppily painted before gluing the poem off center, the hand prints they pressed on the construction paper, or the button-encrusted popsicle stick frame displaying a photo from a long past age of innocence? I don't go to the movies very often so maybe I'm just not used to seeing certain things. I went to the cinema with Kathy and we watched a humorous movie together. On the way out we both stopped to use the restroom. What I saw while in the bathroom raised a few questions for me. A man came out of a toilet stall with one arm embracing a full bucket of popcorn and his other hand clutching a giant cup of soda. * Do they have flat screens showing previews in the stalls? I did not look to see. * At some point you need at least one hand free. Where do you put your popcorn and soda? * Could you not wait to buy popcorn and drink until after? 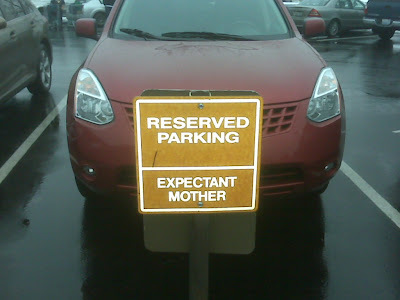 Seems like a logical alternative. There were no lines at the snack counter. * At some point you need wash your hands. Where do you put your popcorn and soda? Problem solved. He walked straight out. Hey, are you gonna share your popcorn?